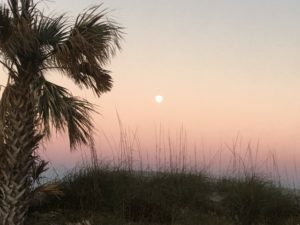 My wife and I love moonrise at the beach, especially when it’s a full moon. We take our spot in the sand, sometimes with a few friends and some wine, and look over the surf to the horizon, waiting expectantly. 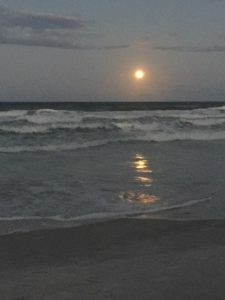 On a night when it is crisp and clear, the place where it always seems to rise will brighten, and then the luminescent edge of the moon will suddenly appear, only to grow into a huge, pale, yellow ball in a matter of minutes, standing momentarily on the dark ocean before it continues its ascent into the sky. Last night was the rarest of moon events, what CNET called “a trifecta of lunar awesomeness”. Not since March 31, 1866, have we had a Super Blue Blood Moon, when the moon is at the closest point in its orbit to us (a mere 223,000 miles away), appearing super large. It is also the second full moon of the month (thus, “blue”), and will turn a (blood) red hue as it travels through the earth’s shadow in a total lunar eclipse. We planned to have a couple friends over to watch the once-in-a-lifetime confluence of lunar events. But I miscalculated, noticing the moon was already up and above the dunes as I drove home during daylight hours. Then I read that we on the east coast would mostly miss the eclipse since it was scheduled to be visible here only as the moon set, dipping below the western horizon. While we did gather around the fire pit and stare for a couple hours at a magnificent full moon in a perfectly clear sky, I felt a momentary tinge of disappointment because we missed out on two of the three events that made this moon very rare due to the quirk of living in the Eastern Time zone. What, indeed? Yet the One who made the vast heavens and set the moon on its predictable course is mindful of us, and does care. And because of his great love for us, the Bible states, God has saved us by his grace (Ephesians 2:4-5). That is a truth which fills me with wonder and gratitude whenever I think about it, even once in a blue moon.